Simian line – what are the advantages? 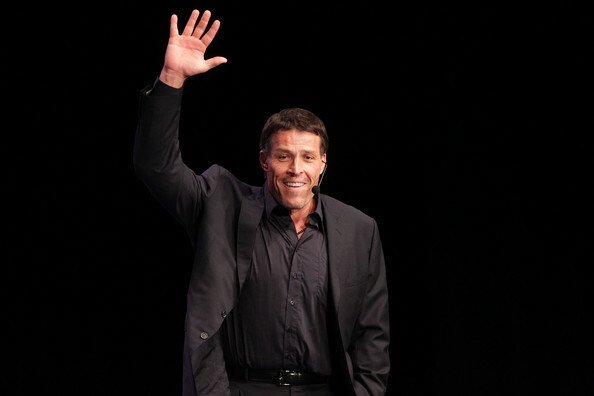 I’ve just realized that many of the people I deeply admire have a simian line (also called a single palmar crease) such as Tony Robbins. I was listening to an interview last night, Dean Graziosi speaking to Tony Robbins on confidence. Tony described his first few months as a speaker, when he was still a teenager working for Jim Rohn. At that time, the top speaker in the company only spoke 3 times a month and Tony told him he thought he was lazy and that he would dwarf him within his first few months. Tony then set out to do just that. How? Tony made it his goal to speak 3 times a day rather than 3 times a month. And he kept detailed notes of what worked and what didn’t. After the first month he had already had more than 2 years of equivalent experience. After 6 months he had the equivalent of 12 years of experience and he outperformed the company’s top performer. What has this to do with the Simian line? People who have two major lines in their hand/s instead of three major lines (called a Simian or single palmer crease) have the energy of the heart and the energy of the head running in one cable. This translates into an ability to focus on a single task or subject with unstoppable drive, energy and focus. Tony has a Simian line and his story above perfectly demonstrates this gift. Make a list of all the things in your life that once seemed difficult or impossible but now you have it. How did you go from impossible to possible? - acknowledge Grace. “Life happens for you, not to you, when you acknowledge it.” says Tony. Find a topic or career or hobby that really brings you alive and make that your focus. Always double your check communications to avoid feeling misunderstood. If you have a child with a Simian (also called single palmar crease) don’t see it as a problem, see it as gift. The only way you will find this out is through dialogue. Perhaps your child needs to be given the freedom to widely explore his or her own interests. 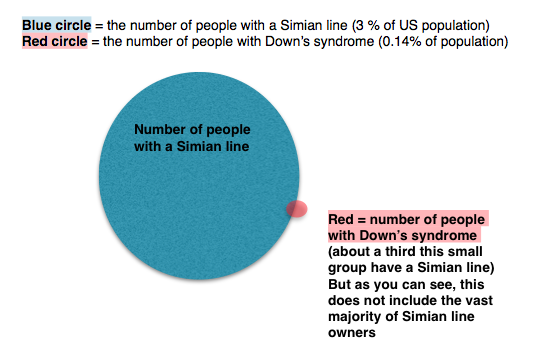 The Simian line gets bad press because it has been associated to Down’s syndrome. However, only a tiny percentage of Simian owners have this condition. You can read more about this and other Simian facts here. You can also watch a video about the Simian line on the same link. If you have a Simian line, explore the lives of these people (who also have a single palmar crease), and learn from them how you too can use your gift. 225 comments to Simian line – what are the advantages? i have simian line in both hand and just want to know is it lucky or unlucky , it is good or bad? It is neither good nor bad. It is a quality you can either use or not use. Use your gift. I am Arnuld from Philippines born June 18, 1985…I have 2 hands both simian…I am curious of what this means, My dreams is Universal…I think my talent/skills are multiple intelligence! My problem is someone evil spirit tempted or trigger my mind! I love communication diverse people maybe I’m congenial…I’m religious, passionate, optimistic, driven, ambitious, positive thinker…I think I am full of strength and endurance! My ambition is to become a President or Ambassador of the Goodwill…I love Painting/Drawing, Sports like tennis/table tennis, basketball, Martial Arts…but I not like offensive games like wrestling or boxing, not like gambling…I want adventure, traveling the world…I like leafy foods, vegetables, fruits and herbal medicine…I not totally believe Doctors as our totally healer…only God I believes! I want also to study in Known School hopefully in USA…I want to study challenging courses like Astronomy, International law, Business studies etc….I graduated Industrial Engineering here in the Phil…Iike humanitarian and Charitable works my dreams countries to visit are Africa, Israel, Canada, Europe, Auatralia, Russia,Greece, Brazil, America etc….I have also diversity of moles in my face in the center of the eyes and eyebrows! and many parts…I’m curious on my blood type since for now I don’t know…I afraid and nervous If I see blood in my wounds or other people…before I admit that I’ve encountered misfortune or bad luck! I’m suffering unpredictable sickness which I don’t know I am mindness and gone no where like robust man my energy is very strong! Which other people can control me…but for now thanks to the Lord I am fully recover and learning how to control my emotions, I am enlight on the experience that I’ve encountered before that’s why I’m doing good and always pray everyday and attending daily/sunday church…I am a Roman Catholic but I open minded to different religious belief I am open to here them maybe in worship or bible sharing or rituals so I can get an Idea for them…I like musics and quotes that’s why I decide to collects Christian songs, Old/New love songs, different/vast quotes…hopefully I can share or disseminate to people whom like this…my problems also I am single because I have a standard of getting a wife I cannot find here…maybe my dream girls are simple with slightly sociable foreign ladies maybe a blue eyes or brown eyes who is understanding, caring and adventurous! Can you help me? Joke…I like joking and I am easy going…I like different/unique beauties…Maybe I want to be like Abraham! Joke…I want many childs…I want long life productive and worthy living! I not like acting I like Pragmatic/Practical…I like debate in any topic…since I think I can solve problems in my own unique and conscience mind! I can predict/forsee good or bad! I like brainstorming or psychoananalysis…My biggest assets for now is Faith! I not totally value money compares to happiness, productive and worthy living! If I given a chance to become opulent/wealthy I will share more than 1/2 of my income/assets to paupers/distitute people…Thank You & More Power!!! Alleluia…Amen!!! Arnuld faith is a big asset. Hold onto it and all will be well. Simian lines are about focus. Read the post and the comments. Good luck! Hey arnuld….I have also same problem,things , nature,way of living style what u have.its nice to see that u are my type of person that i feel every moment , what really i am. I do have simian line on either of my hands! Can we come in touch with each other so that we could know about each other! So that we can compare and contrast the similarities and differences we have !! I am really confused with my simian lines …let me know if u can help me understanding my hand! And i m from nepal too! Hello Shreya, I am from Nepal .Are you from Nepal? If you then we can make a group of simian people from Nepal to discuss the information about the simian and its nature to solve problems. I have simian lines in both the hand and working as Asst Prof and good in sports too. Now that both of my daughters have simian line though first daughter in both the hands like me and second daughter in just one hand. Is this will be passed to their childrens too? I have a simian line in my right hand so it is good……….can you tell me this about in brief. Sudhir, that you are facing more challenges may just be your perception. This has nothing to do with your Simian line. Use your Simian focus to focus on something positive that fascinates you and all will be well. even also i have simian line on my right hand. I am always facing challenge , problems and difficulties in every work. As others its very simple. Someone said that this is good because all that will make you knowledgeable and Tough. I always get in trouble in simple things also. please guide me what should i do? And other mentioned i also face the problem on focusing and dont want to work under others like corporates? . Always think about business idea . Jayesh, it sounds like you need to get really clear on what interests you. Then take yourself to the feeling state where that can be your life. Everyone is always facing challenges. Not just you. It just looks like it it only us..
train your focus as this is one of your talents. Right now you are like a magnifying glass that can really focus being pointed everywhere and that can cause unwanted fires..
Hi Jayesh, I read your comment and you seem like my ‘identical lifestyle’ twin.. every sentence you’ve told applies to me too.. and I have also taken a break in my corporate career because of loss of focus and different ambitions. Same here going through hell with employment I have tons of experience and certified. But Im hitting brick walls. I them on both hands my left palm was badly burned and to the point I had double surgeries when I was 3. The line was damaged and now somehow is coming through the scar tissue undamaged. I have simian line in right hand will it be good or bad. Sakshi, that depends on how you use it. No marker is good or bad. Always ask if people heard you correctly (double check your communications) and find a passion to focus your energies on… forget about prediction. Take your power back. The best way to predict the future is to create it yourself..
yes Angel, agreed. It is more relevant here because the Simian line is so eye catching many people get fixated and then search for evidence that it is the source of all their troubles. That becomes an endless self fulfilling loop…The Tony Robbins video I mentioned on focus and asking yourself the right questions offers a way out of this loop. Hi Anju, I disagree with anyone who told you this. Simply let go of this thought and free yourself. Set a positive intention for what you want instead and then imagine how happy you would feel if you got it. Now feel that feeling of joy every day. get dr Joe Dispenza’s books to help you with this. Good luck! Mark. please read the post and all the comments related. It’s a gift marker to do with tremendous focus. Sir i have simian lines in both of my hands so what does it mean? Is it good or bad? Ansh, It is neither good nor bad. You can invest your spirit and your tremendous powers of focus in good or bad . Which do you choose? hello sir ,i have simian line on both hands.what does it means and is it related to our life or just lines. Shikha, find something you love to focus on an stop looking for problems that don’t exist unless you dream them up..
As a Aries Double Simian (Double trouble ) , always interested reading about it. I really like the way you respond to the question. I 100% agree with you having simian is not good or bad it can be a blessing if we know how to utilize to our best. To all other other guys who are reading this, please take this as positive thing make the best of this. Well said Dan! See the blessing. Hi Jenna, messaged you regarding Atlantis which you have replied..i cant find your fb profile for some reason.anyways, there is a whole community of Simian people like me where we discuss the implication of having these lines.In fact there is also published literature which is a Legend about those kinds of people.If you like to join please message me. It means you are focused and reliable. Go for it Rakesh! Use your gift. Hi Jenna, please give advise, for these past months I am experiencing financial difficulties..
i have both palms almost identical with simian line..
Bobby, your Simian lines are to do with how you process and express information and emotions. I’m not sure that has anything to do with your financial situation except if it is related to miscommunication. I have simian line in both hands but I have heart line and mind line as well what does it means? So it’s good or bad depending upon our approach towards it right? Purshottam, yes. Use it as a powerful resource instead of trying to beat yourself up. i have simian line in both hand and there iz tiny tiny many line in my both palm . and i have cross sign in jupiter mount.. wat does this means?? Thank you for this post and open comments. I appreciated the way you guide us. I have simian lines in both hands, Well this will be use as a resource nor a blessing. Well said keep it up. I have a simian line on my right hand but experienced a loss In business . what can I do plz tell me. Sumit, probably it was due to miscommunication. Someone misinterpreted what you were feeling because Simian types often seem aloof even when they are not. Always double check your communication: is this what you said? or what did you hear me say?…. then you can correct/prevent misunderstandings right away..
how can i use the simion line i have for my success? does the simion line tell anything about love? only that people might get upset with you by misinterpreting what you are feeling, thinking you are aloof when actually you are being compassionate. Always double check your communications to avoid misunderstandings. I have Simian line on my left hand . Wow I thought I’m the only one who have this..
ok! thank you very much for the information.. I am good in studies , sports and everything good. I am also a topper of my school. And i want to become a scientist.But sometimes i may suffer from health problems such as common cold, body pain weakness and so on. Is This a serious problem? I have simian line on both hands. I am a software engineer. Will it be good for my career? I have simian right hand very strait simian full line please can you tell me this lucky or unlucky? and good or bad? hi! Jena. I am a big fan of yours. Because your reply is just awesome and appreciable. Ayush, markers are always neutral. So… take it as good! Ayush, the marker is neutral. You make it good or bad through interpretation. See it as good. cn i knw abt his age???? Achala who do you mean? Tony Robbins? Both of my sons have simien lines on right hand. Must have something to do with my american indian ancestry. Hey! I have two simian lines on my two hands. I lacks communicating skills with peoples. I am shy. I am a teenager. I even dont think about my future. I thinks a lot. Sometimes i felt i am a genius. Liza, it is not your Simians that give you a temper. They simply focus whatever energy is there. It does not serve you to think of your life as hard due to your Simian lines. This is not correct. no Khojit, it is not a bad sign. Focus on what you really love. Imagine how you will feel if you achieve some goal. Now take yourself to that feeling state as often as possible. I have simian lines on both hands, people dont understand me and they say I have talent and all. I just want to make everyone understand how I think and how I feel. Aman, simply realise that you come across diffrêrtly to your intnesion so they are not hearing what you mean. Keep double checking your communication with them to make sure they really do understand how you feel. hello jena griffiths, i have straight line on right hand ie simian line,and also in left hand….whatever i predict that will totally wrong, my expectations always went wrong…i feel that i am very unlucky in every aspects of life…i feel very difficult to get job as well why such situation arises…what are prospect solution please kindly reply me…. Vishal, start anticipating a brighter future for yourself. Then use your focus to get there. Why not try something called “Afformations”. Ask yourself “why am I so lucky?” or “Why is it easy to get a job?” Then your mind with its laser focus will find a way. Try this a few months and then let us know what happened. No more focusing on doom and gloom. You have extraordinary potential. Use it! My son have simian line in both the hanfs.He is studying in class 11th in science stream.Will he be an IIT an. How will be his career opportunites in future. Susanta, watch this video from Tony Robbins. and get him to watch this too. It shows you how you are asking (and attempting to answer) the wrong questions and how damaging this can be. Tony has a Simian line and so do many other brilliant people. I have simian line in both the hands and have a problem in personal life as well as how to fix my career. is there any solution? Deepa, there is always a solution. 5. To improve your personal life, improve communications but realising people are not hearing what you think you are saying – check! Misha, this will be due to other matters not your simian line. what is the conflict about and why are you unwilling to resolve it? Hi Jena, i have simian line on my right palm and i’m jobless at this moment. Is it good or bad for ladies to hv simian line on right hand for career? I have Double Simian line and im often misunderstood qnand no one understands the way I work and People ask me how can I speak so much for so long and how cpme I know everything and Almost everyone who knpws me saya that they cant debate with me as I’ll win every time. Dear Jena, I have a simian line on my right hand. At previously I never believed on these lines. and I always believed that I M a luckiest person that what i want always comes true. Now I m 35 and i m feeling stressed and disappointed. sometimes in deep pain. Nothing is going fine with me. I m jobless now, earning source is poor, all time i m going with depression..there is no scope anywhere..I feel like i m cursed. Afroz, your circumstances have nothing to do with your Simian line, instead your Simian line can help you get out of your current slump. You have a gift of focus but are focusing on the wrong thing. What you need to do is shift your feeling state by focusing on all the things you have rather than don’t have. What do you feel grateful for right now? These might be really small things it doesn’t matter. It might just be that the sky is blue and not currently raining. that you are alive, that you have internet, the ability to write to me…etc. Now feel that gratitude intensely in your body. Then decide what job you would like. How will that job make you feel? Stay with that feeling at least 5 minutes a day. Look for a video I posted in these comments on focus. This will help you particularly the last part of it about shifting your feeling state. I have simian Line in both my hands, I am 46 years old and I was studying electronics and working almost 22 years in telecommunication stuff. I already read many articles about simian line, advantage and disadvantage, and Most things what they already mentioned I found in me. I am trying to use this advantage to improve all this inner potential. Is there any book or knowledge that I can learn? The best thing for you to do is read about Past Reality Integration by Ingeborg Bosch. There are a few books available. Dear Teo, Thank you for reaching out. This proves you are smart. Whatever urges you are feeling has nothing to do with Simian lines. It’s because you feel hurt and don’t know what to do. You need help. The universe is here to support you but it can only do this through other people. It is important that you reach out to someone you trust who is right there with you. Do not act on your emotions. Reach out to someone else instead. Archit, see it as good. Then it will be. Teach him to double check that people understand him as he is probably very clever. I have simian line on both hand. I always tell everybody that i cannot drive and it is very impossible. One day, an emergency occur, I need to go at the store but I do not have a ride. I walked 5 miles. Since that day, my brain keep thinking about driving. I told myself I need to learn how to drive. Since then, for three months i never stop searching reading and learning about driving , about DMV and all I need to have a driver license. I have so much focus and devoted my time on driving lessons both written and behind the wheel. Now, i cannot imagine myself not driving. I enjoy every single day driving my own car. I believe about that extreme focus and concentration on something. An impossible in my head became possible because of my strong drive to learn driving and get my license. I need your help,,,I have simian lines on both hands,,,i have many problems and dissatisfactions in life. Am 28 years old and I always restless.i never married and had no close connections to anyone or any place. I never stayed on a job longer than a few months.,,some people call me abnormal ,,,plz tell me what can I do ?????????? I need your help,,,I have simian lines on both hands,,,i have many problems and dissatisfactions in life. Am 28 years old and I always restless. He had never married and had no close connections to anyone or any place. He never stayed on a job longer than a few months.,,some people call me unique or abnormal ,,,plz tell me what can I do ?????? Dear Amritpal, first of all stop reading all the nonsense written online about Simian lines. And stop believing people who say this is a “bad” marker. There are no bad markers. Only bad interpretations. We are all unique in some way. We are all One too at some level. Unplug your thoughts and try to feel instead of thinking. We think to avoid feeling. And then we think someone else has the answers and this is a mistake which could take you through a huge detour. You have all the answers within. Your mind clicks in and starts racing as a way of not having to feel. What you have is a strong focus that you are pointing everywhere. Like someone with a magnifying glass pointing it all over the place and starting fires wherever it rests. Know you have a powerful tool. Learn how to use it to create what you want rather than what you don’t want. There’s a link to a Tony Robbins video on focus somewhere in these comments. Focus on that video and watch it a few times. Then write to me again here. then you can also help others around you with this too. by the way, the best way to learn is to teach others. why not also help others by teaching them the daily practice Tony teaches? I also have a simian line… Bt the thing is line which started from heart is stabled & it ends on brain line which is scattered with many line what does that mean? Hi Nikhil, no idea without actually seeing your hand. Ingeborg Bosch – Illusions and also Byron Katie – a mind at home with itself. Let your heart choose the one that speaks loudest to you right now. I have a simian line in both hands, and im thinking negative things almost every day. I play bass guitar and im not so social. I have a long Head line. I have depressoin and somethimes i lose my mind. How do i get rid off these negative toughts. I love my parents and my pet. and look for the video in the comments to this post by Tony Robbins.. I have a simian crease on both hands, plus I’m ambidextrous any relation…? I have a simian line. Will it affect my life in the future because I got it from my dad and I am scared something will happen to me because of it. I have a simian line on my left hand and found out that I carry a genetic disorder called Robertsonian Translocation. I’m a balanced carrier so I have no signs of genetic abnormalities but is this a sign of the genetic disease? Is this necessary that every person having simian lines is suffering from downs syndrome. I have simian lines on both my hands and i am all fit physically mentally like any other normal human being so i know m normal not suffering from any disease.. but what does simian lines on both palms means?? Tulika, read my other posts related to Simian. I even created an image of this with overlapping circles to explain percentages.The vast majority of people with Simian lines are perfectly normal. Only a very very tiny percentage of Simian line people have Downs syndrome BUt research has focused on the Down syndrome population( which is a very tiny percentage of the overall population) and this very small group has a large percentage of this marker. Even though +95% of people with a Simian line do not have a genetic abnormality. Go look at the image I created to understand this and please stop linking the two. This is an inaccurate assumption. I have simian line on both my hands. I have problem in decision making and I can’t do in any of my work due to personal life or my studies. I feel depressed even for small things.. Everyone is like it is your fault.. how to overcome this? Your Simians can really help you get through all this. Use them by asking questions that take you where you wish to do instead of questions that dig you into a rut..
Good luck, I believe in you! Thank you sir. I’ll definitely do it!! Hello, I just fell in love with a man with both hands simian. Although I am conscious and aware, familiar with palmistry and the healing arts, I have never met anyone ike this. I am afraid he will never be able to love me the way I know love to be. Please, you must have some insight on how I can help this man. I feel obligated by the Love to help with this multi-dimensional gift and I don’t even know where to start. Hi Kellie, you are in love and that is all that matters. Do not create problems where there are none, simply by thinking too much or worrying unnecessarily. The path to a successful relationship with a Simian type is to always double check your communications to make sure you understand each other. In other words ask, “Is this what you meant?” and then rephrase it. I’ve read a lot on simian lines and it’s crazy how accurate the available information on it is. I got one on my right dominant hand. It’s crazy how different I am than everyone else. Through many ways, my thought process always overshadows others with alarming extremism. I have an abnormal amount of mental strength and focus for whatever it is that I want to do. I know there is nothing I can’t do. My self-awareness is extremely high and I have most parts of my life figured out. But the one part of my life that I’m constantly trying to figure out is my social life… I’m in college right now. Throughout high school and currently in college, I’ve had a lot of acquaintances but no real friends. The only reason that I can confidently think of that might be the reason for no close friends is being intimidating. Aside from the simian line, I happen to be really really blessed. I’m 6’2, eyes are blue, everyone says i have movie star looks I’ve even heard I’m the hottest guy theyve ever seen by many as well…I’m big, strong, ripped, athletic, manly, quick and smart. I know how to talk better than almost everyone (could partly be cuz i was raised in a family of business people lol). I can also be very funny… As douchey as this sounds, I’m not only a stud but literally the whole package (considering what things people desire in others).I’m mentally and physically the toughest. I’m not a follower. I’m not at all afraid to rebel against authority if I feel it’s justified. I’m not really afraid of anything lol. That being said I’m the most reasonable kid you’ll ever meet. I’m truly the most loyal, selfless friend one can have. I know it may be hard for you to believe that I really am all of these things, but it really is the case! (And it’s not that I’m some delusional narcissist lol like I really am all of these things!). And I’m NOT socially awkward AT ALL. Which is why it’s mind boggling to me why I’ve never had close friends or even a girlfriend (I’m 20 and still a virgin too smh). Part of this I know for a fact is cuz I have high standards and expectations for myself. I don’t want weak kids in my inner circle. For example I will only consider dating girls that are hot and somewhat intelligent. You might say that’s being too shallow but being who I am, why should I have to settle for mediocrity? Anyway I always grab girls’ attention when I walk in the room, but I never get direct attention when I approach them. Could it be possible that I’m THAT intimidating? I always make sure my movements and everything is tempered down when in public (I know I’m naturally intense.. and i’m italian with a ny accent lmao). I really don’t understand… Its so frustrating cuz I’m such a good person and I literally have everything people ask for. I’m not even really that upset about it anymore cuz I’m just numb to being rejected and lonely now. It pisses me off how pretty much every other guy whos also “the complete package” has a great or at least decent social life with close friends or at least some hot girls. I use the anger I have from having this bad social life as motivation to do whatever it is that I want. Do you think the problem is I’m too much for people to handle? Like does my simian line intensity combined with being the complete package make me too intimidating? Johnson, the challenge of the Simian is you tend to come across as aloof. So that’s one factor. It’s possible also that people don’t “feel” you; that you are really emotionally present. I recommend you try to be more open and vulnerable, for example, share something deeply embarrassing about yourself with someone you like. Vulnerability takes courage but it opens your heart and the hearts of everyone around you. We are all way too defended. Taking off your armor makes you human. Also get a book on past reality integration by Ingeborg Bosch (hay house) and learn how to systematically reduce all your defenses (armouring). Good luck there! it’s common to have fragments of either a head line or heart line. Meaning is the same. Ratiranjan, of course love and marriage is possible. Most people with Simians get married. Your simian line has nothing to do with it. You might come across as being aloof so pay attention to when you are feeling misunderstood and then ask for feedback what the other person heard you say, or how they interpreted your intentions. Brittney, super smart mum, treasure him and teach him to be fully present in live and love deeply and all will be well. Balaji, the best way to predict the future is to create it yourself. Take the Simian lines as good fortune and move on. I’ve simian line in my right hand, but I can’t focus on anything, I want to do… I get distracted, for no reason… By the way, thanks for sharing positive Thoughts.. I have simian lines in both my hand. Now I at my mid 30s. I am a stubborn child and always scold my beloved when they doesn’t agree with me. I have been gambling in casino since 21 years old during my university day until now. I cant get rid of my gambling addiction. When I am gambling, I really focus and always want to win and I really don’t know when to stop even though I lost a lot of my own and family money. I also never ever focus on my job since my graduation and I keep thinking making a big money through gambling even though I had lost lots in gambling. I never regret and wake up from my addiction. I don’t understand myself. Why I still gambling even though I keep losing. Are gambling addiction is got to do with simian line? Hi Han, no an addiction to gambling is not connected to the Simian. You have an addiction to the feeling state that gambling brings. The rush? Danger sometimes makes us feel more alive. How do you feel when you are right in it? What’s the benefit? The only thing I know of in your hands that might help you understand this energetic dynamic is your fingerprints, as they are a blueprint of your programming: what switches you on, what switches you off. But that’s just my thesis. In the meantime you can help yourself with any addiction, by pausing just before taking the “poison”. There’s a split second when you have a choice. So instead of acting or reacting you stop a minute or 2 and just breathe and observe yourself and what you are feeling. See yourself from the eyes of your inner witness wanting that “rush” but realizing the enormous cost. Do you want to pay that much, and cause so much pain, just to feel alive? How else can you feel that alive without destroying your life? I recommend you get yourself the book “the Presence Process” by Michael Brown and try his 10 week program (it starts with connected breath work x2 per day) to integrate unprocessed feelings of fear, or grief or anger that is actually what we are avoiding feeling in the first place; what stops us from feeling fully alive 24/7. I believe this is the work we all need to do urgently, to become more fully embodied. Most of us are totally in our heads 90-100% of the time. Other ways to deal with an addiction: maybe apply the 12 step program from Alcoholics Anonymous which is proven to work on any addiction, part of that is getting moral support from others. There’s also the books by Ingeborg Bosch on past reality integration. This is a similar approach to Michael Brown but more mental and would require the help of a PRI therapist (approx 10 hrs) to do properly. Basically you can cure yourself of this using one of the above methods and your Simian line will help you stick to it, instead of helping you “stick to” addiction. I have simian line on my righthand, I know my thoughts and way I deal the work is smart and diligent way, but people are making me dump and. This what happens to simian line, please advise. Srinath, could you please explain a bit more about your situation? I’m not sure what you mean. anyone to control my own feelings and emotions which sometimes go into disappointments and misunderstanding.i try to have more patience than stressing myself from negativity. Do you think it is the real characteristics of having simian line? Vivian, focus on correct breath work. This will help you get your 3 “intelligence centers” in your body in sync. Gut, heart and mind. The danger for many Simians is to think too much. Who wants to communicate for ideas? Hi I’m Jeff from HK, i have simian line on my left hand. I have simian line on my right hand. it looks like heart line is dominating head line. I have complex emotions. you’re right about being focused on a single work. But when it comes to emotion and woman, I can’t focus on my studies. I have simian line in my both hands. Both heart line is very bold and straight . I’ve heard many times that it is lucky to have that line especially on both hands. And I wanted to know if is good or bad? Michelle, this is NOT about fortune telling. There are no good or bad markers. It depends on what you do with your talents… use your gift! I have simian lines on my both hands…Now that I read all your thoughts about it…I could hardly believe myself am i special too?? Take it as a positive reminder every time you open your hands, that you have a lot to offer the world. If you are ever having difficulties double check your communication with others as per the article above. Prashant, meditation is beneficial for everyone. But yes! Hi Prashant, Most of us think way too much, but Simians even more so. Now consider this: thinking is not feeling, thinking something we do to avoid feeling! The most dangerous sword you can fall on is not to be fully present with another person because you are so busy thinking. We avoid being fully present because being present is so intense. We have to deal with intense feelings that we have labelled as bad, such as sadness or shame or fear so we push these feelings away by coming up with a narrative. And then when someone gets upset because they can’t feel you, you may feel misunderstood because you were thinking you were fully present. (Your body was fully present but you were in your mind thinking.) The advice I gave previously is to rephrase what you think the other person is saying and then ask, is this what you mean? They then feel more understood and connected to you. But actually it involves much more than this. Here’s a good challenge for you: give your simian focus the job of actually identifying what feelings you are trying to avoid by thinking. And then don’t think anymore just feel whatever it is without pushing it away. Where is it in your body? Breathe into it and into your belly, just feel the feeling with no thought, no narrative. And remember there’s 90 sec rule. Any feeling can’t last more than 90 seconds. If you really feel it, it dissolves. This often feels like air bubbles in your chest/ like more oxygen. Unless you reignite the feeling with a thought then it could go on and on for decades. The feeling states that we try to avoid are usually the ones that we were born into. So some homework for you: Think back to when you were a very young child. What feelings were your parents trying to avoid? If you can dig up these old feelings and feel them til they dissolve, then replace them with a vision of yourself being really happy you will have done your family and your future self a huge service. And you will become much clearer on what your special focus should be. Can you send me the link where I wrote that? It must have been a very long time ago? Very good that you are practicing exactly what you need to do, rephrasing what you think you hear. Brilliant Prashant! If you can keep doing that all will be well in your life. this challenge of living in our minds and thinking about the future or past, instead of just being present to whatever is arising is so prevalent today, also with non-Simians. But Simians really need to watch out for this. Just remember there is nothing actually wrong with you. There is nothing to fix, except switching off the mind. Or at least observing it running… and not reacting to it running. Like Vishnu. I suggest you quit reading up on what this line could mean and become a master your mind using this guy’s work. Prashant, I tried to go into that old blog and edit it but I can’t. It is so old it is non functional. Focus on what is written here on this page. Prashant, before you start something, decide how long you want to spend on it. And then set a timer on your phone or watch so you know when to stop. Or ask someone to come in and remind you of the time. In the morning decide how much time you want to allocate to certain things. Right down your main goal for that day and already see yourself happy because you have done it. How does that make you feel? Feel happy and grateful because you really can do this. Feed the positive perception of yourself, starve the negative one. I believe in you. Just do it. Prashant, these are two different types of thought. Don’t worry about the difference for now. Whereas feelings are states, that carry the thoughts. It’s the medium that the thoughts “swim” in. Just like water is the medium that fish swim in. Let’s look at the theory first and then try apply it to your situation. For example, “Ah, I’m listening to Radio Sadness today!” or “I’m listening to Radio Shame” or Radio Anger and so on… Thoughts are not actually as personal as we think they are. We think they are ours but actualyl they belong to the frequency they are embedded in. You are just tuning into the radio station that carries these thoughts and you can learn to move from one radio station (frequency) to another. All the sad thoughts that have ever been thought before are all on one frequency and when you tune into that frequency you get bombarded by them. The only way out is through; to sit with the feeling of sadness and actually feel it. A feeling can only last 90 seconds unless you reignite the feeling by thinking instead of feeling. Usually you can feel feelings by becoming aware of changes in your body. For example, a tightness in your chest and pressure behind your eyes and your eyes water. You then sit with the feeling and breathe into your belly (like Michael Brown on link above teaches you) and a minute later the feeling completely dissolves. You have then freed your energy from that level. Then use your focusing powers to focus on what you want and take yourself there by feeling how you would feel if you were already there. For example, Happy. Delighted. Peaceful. Grateful…. Now let’s try do the practical side. You said you get stuck doing something less important and then forget your goals. So, how does thinking this make you feel? What’s the feeling state that this thought swims in? Ma’am being lefty (mean left handed personality) incrise the power of simian line? Prashant, I don’t know. I guess it makes no difference. No research has been done on the vast majority of Simians who are completely normal except having their brains wired slightly differently. As far as I know, the only research being done is on a very very tiny percentage of single palmar crease people, those very few who have Downs etc. These research projects were funded by medical companies who are profit orientated. We need to build a huge data base of hand prints and people’s lives with lots of personal data for future generations to study. So actually no one can answer these sorts of questions reliably until genuine research is done on very large samples of healthy individuals. Would you like to be part of a research project like that? Could someone where you are make your hand prints? Focus on the positive Prashant. Everybody has both positive and negative possibilities. The marker is neutral. maybe read his biography rather than listen to what palmists say about this marker. This reveals to you the program you are running; what triggers you (causes you to drop your energy). and also what makes you feel deeply fulfilled. Good luck Prashant! You can do it. Focus! I also have simian lines on both and electrical Engineer too from Nepal. Prashant sir ,it’s better to share our experiences and information related to simian nature.i would like to meet you in social media. I’ve seen this over and over. You just have to trust that this is how it works and watch it unfold. Become what someone once called “a reverse paranoid”. In other words, the exact opposite of someone always thinking something negative or bad will happen. Instead think, “I wonder in what way the universe is trying to support my greatest good today? If something “bad” happens, stop judging it as bad. Trust there’s a reason we can’t yet see. Feel gratitude for whatever good it is bringing. There’s always some hidden benefit. It might be a vital connection or knowledge that could change everything for you. Say, “I don’t know why this has happened the way it has, but thank you. I trust there’s a bigger picture here for me personally that I can’t yet see.” If you can’t do this then it means you are lost in one of the many radio stations of the mind. You are busy buying all the “thought candy” on that particular level (shameful thoughts if you are tuning into radio shame, or guilty thoughts if you are tuning into radio guilt, or sad thoughts if you are listening to radio sorrow or angry or frustrated thoughts if you are tuned into radio anger…) Stop thinking and judging and you will be totally surprised. Hello sir, my name is kishan i am from india. I have simian line in my left hand and i am also left handered. Is this good for me?? Or not?? Or what it means? Does any celebraty have this?? Kishan, please read the post above. It is written to answer your questions. Hand markers are neutral. You need to decide if you want to use your capabilities. There’s a list of some (not all) celebrities at the end of the article. Many of these have helped millions of people worldwide. My personal favourite is Neale Donald Walsch who has written dozens of books and in the process has Read his series: Conversations with God. I think the most recent is called “Already Awake”. Hi Jena, can u advise me regarding my palm line.. On my right hand, i have simian palm line where head line and heart line forms a straight line. I can see that my heart line and head line on my left hand is connected via a zig zag line. My career is not smooth and i’m facing alot of difficulties at work in terms of my work relationship and miscommunication with my boss. Can i have some advice from you please? Thank you. Wei, feel compassion for your boss. He possibly thinks you are aloof or judging him or acting superior simply because Simians come across as very mental. Tell your boss he can trust and rely on you and then demonstrate this by always double checking communication, such as rephrasing what he is asking to make you are both clear..
Hi Jena, can u advise me regarding my palm line.. On my right hand, i have simian palm line where head line and heart line forms a straight line. I can see that my heart line and head line on my left hand is connected via a zig zag line in the middle of the line. My career is not smooth and i’m facing alot of difficulties at work in terms of my work relationship and miscommunication with my boss. I wonder if this is partially because of my palm line? Can i have some advice from you please? Thank you. Well learning how to manage and lessen miscommunication is what is the key to success for Simians. Good luck, you can do it! Hi mam, I just wanna know that people with simian palm are not worth getting involved in relationships? Neha, of course not. Simians have a lot to offer. Just double check with them what you heard or what they hear you said and you can build a fine relationship. Neha, put that thought out of your mind. See my previous reply to you. Good day, ma’ma I really appreciate the way you are answering people and solve their questions with a very soft answers,thank you so much…Olumide by name pls I have a Boy and he is a two months old and I discover that he has a simian line in his left hand and I was so confuse because I never come across this before,so I started doing my research and I discover the name of the line is simian line also read a lot about it before I came across you,can you please enlighten me more about this and to put this a small kid truel pls…..my second questions,when I discover this on my son the second day I call my first daughter and check her hand I discover she have a simian too on her left hand, but was somehow divided at the last head of second line,pls enlighten me on this…..thanks so much. Dear Woli, 99% of people with a single palmar crease (Simian line formation) or variation thereof are perfectly normal and usually above average in intelligence. The first thing you need to do is stop worrying. The chances are extremely high that you have a highly intelligent child. The second thing you need to do is stop reading all the zillions of opinions out there regarding what it might mean. All theories are just opinions. The research sample sizes are very small and skewed because they refer only to a tiny percentage of the entire Simian population. See the diagram in my post above to understand this. Until one day in the future, when genuine research is done on large groups of perfectly healthy Simians, we need to ignore all the myths and negative, fear generating, beliefs spread online. Some advice for all Simian parents: be fully present and loving with your children. Allow them to follow their passions to find something they love to focus their attention on. Our children are our teachers. They are perfect and a gift to you however they are. Trust that they are just the way they need to be. Teach your children from an early age to always double check communication with others to avoid misunderstandings or in case they are being perceived as too aloof or too mental. I got simian crease in my both hands.. I never taken them so seriously before and always been in troubled due to my communication, attitude and behavior .. trying to figure out things now. Hi Taranath, I think it is a mistake to think the Simian line is the cause of all your problems. Probably it is the way out. Simply use the advice given above. Stop reading everything out there on the Simian line. Much of it is pure speculation or research based on small population groups that don’t apply to the vast majority of people with Simian lines. As with any child, cherish him and be fully present to him and he will blossom in your love. Probably he is extremely intelligent. Apply the advice in the article above.